This site is dedicated to my pursuits in Amateur Radio, with the occasional Jeep, Airplane, Firearm, Mountain or Explosion thrown in. Enjoy the stories. if you are qrv on 432 for the ARRL contest we can try on sunday (June 10th) some EME. Have here new installed 128x11el. so it needs not much on your side. >20w and >10el. 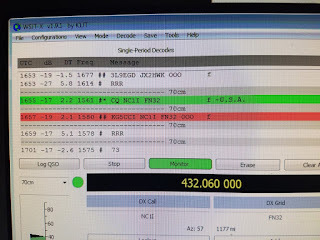 will do in JT65b. Will be qrv from your moonrise till 14:00UTC mostly calling CQ on 063 first. 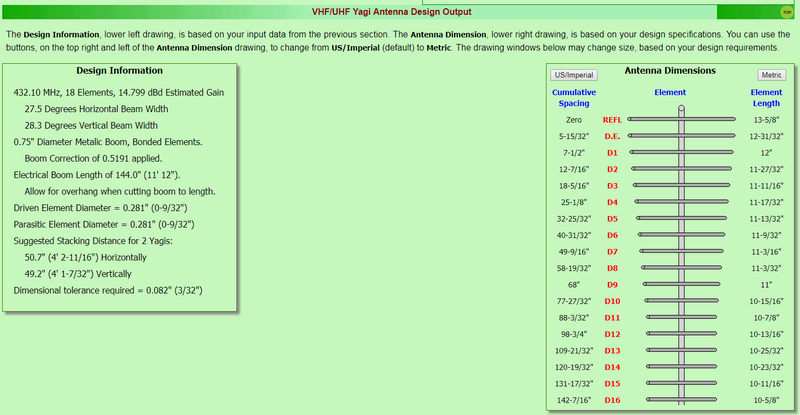 In my spare time (which admittedly hasn't been much) I've been playing around the K7MEM Yagi Calculator seeing what's possible. 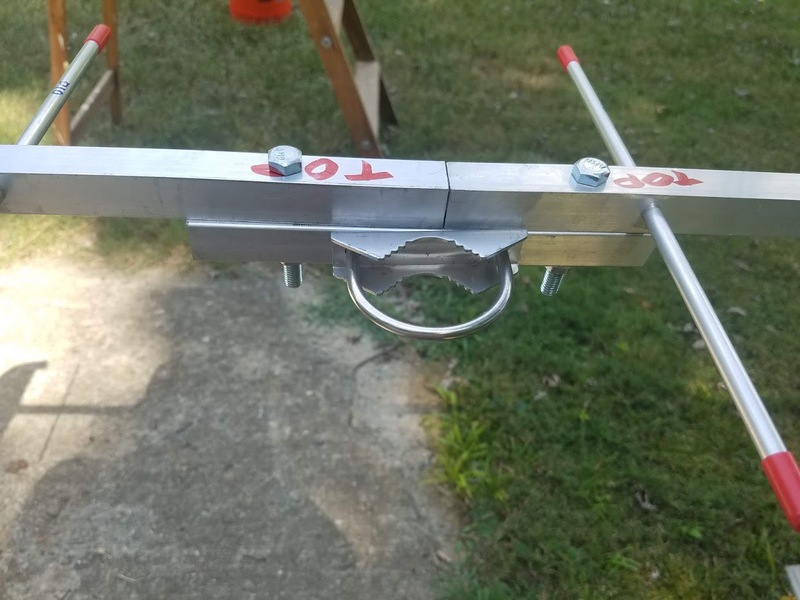 I've also been ordering a few antenna building materials here and there from McMaster-Carr - primarily dealing with custom Arrow designs that W8LID has been cranking out. 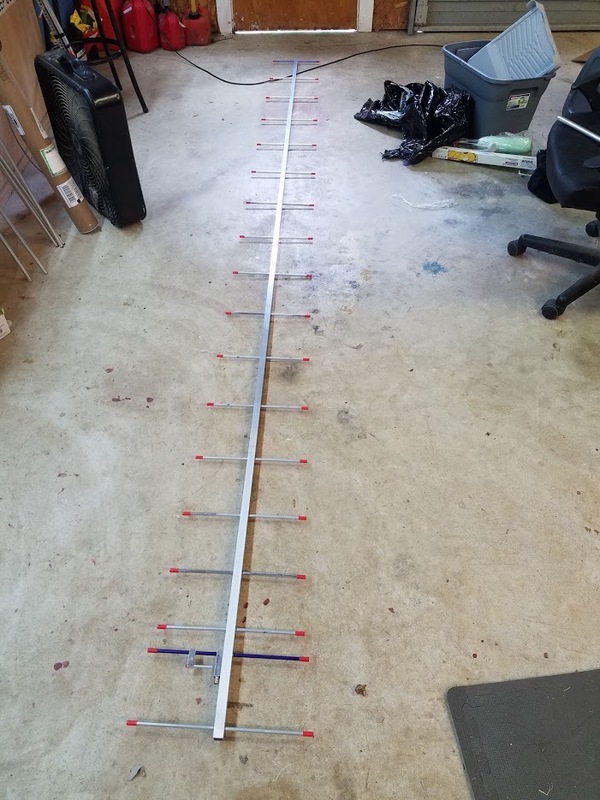 Even though Bernd assured me that 10 elements and 20w would be sufficient, I wanted build something a bit bigger on 432mhz anyway for terrestrial work. Like most of my projects, the early stages occurred before I realized what I was doing, and it just spiraled from there. For my new 70cm beam, I decided to mimic the design of the classic Arrow. I'd order 2 pieces of 6' long 3/4" square aluminum tubing, join them together with some 5/8" round tube, then use Easton 1816 Jazz Arrow Shafts (or 9/32" diameter aluminum round tubes) as my elements. I'd then use a stock Arrow Gamma Match element as my driven and my existing satellite gear to feed it. While the Arrow Driven is tuned at 435, and would be a little short, the adjustable match would make the SWR close enough. I got all my parts ordered, and when it arrived I got busy on the drill press. 18 holes is A LOT to drill by hand, but after measuring about 3 times the actual drilling went pretty fast. Cutting all the elements took even longer, but once I got a rhythm down, it wasn't too bad. 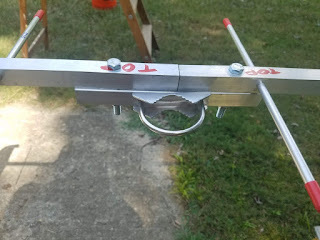 The idea was simple, measure everything out about a 1/16th of an inch too long, use a pipe cutter to trim - glue in a point insert (to thread the elements together) hand file off the excess length and smooth the cut side, slap on a plastic cap and attach to the boom. A couple hours in the shop spread out over a couple weeks, and the 'Lunar Arrow' was christened. Finding a way to mount the thing to a tripod did prove to be a bit tricky. I didn't want to put a saddle clamp and the associate bolts on the same plane as the element, so I cut a small piece of excess 3/4" square tube, and then bolted below the boom vertically, and attached the saddle clamp there. The split boom design with the tube in the middle worked great to line things up, and the under boom square piece had the added bonus of providing some support in the boom break, and made everything tighten up and look nice and straight. It wasn't a precision engineered, computer modeled beam, but I had less than 50 bucks in the whole thing, and it seemed to work pretty well. The only thing left to do was try a contact. I dusted off my trusty G-5500 (Cause ain't no way I was going to hold this 12' beam for the time it took to make an EME Q) and put it up on my 10' mast. I set a sked with Bernd for the 13th of July - when conditions were good - and waited. The setup was as follows - My homemade Lunar Arrow, mounted on my G5500 Rotor System, 8ft' of Times LMR240 Coax into an Icom 821 running 30w on 70cm. Signalink USB hooked into that, going to a Laptop running WSJTX. I was running everything off of my 30A power supply with a extension cord back into my shop, but I easily could have done battery here too. Trees at my house block the horizon until about 20° - so I waited until the computer said the moon would be above them. The moon phase was new, and it was only about 10° off the sun, so I just kinda had to guess at where it would be. I was chatting with Bernd on the HB9Q chat page, so he told me when he began his transmission and I went to 432.063 and began listening. Amazingly, I decoded him on the very first sequence. 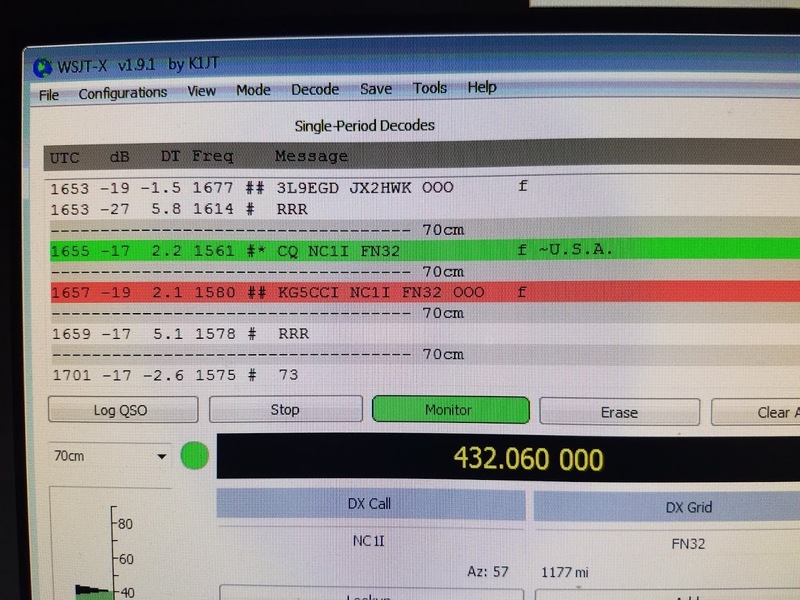 I quickly replied, he decoded me, and we finished the QSO before I even really knew what happened. I've always heard EME QSOs were often a long drawn out affair, but this was just like any other JT65 contact I've ever made. I was obviously massively psyched. I had a bunch of stuff going on the rest of the day, so I had to go QRT shortly after the contact. Just to prove it wasn't a fluke though I left everything setup and came back on the morning of the 14th to try again. This time I managed to decode NC1I, called him, and got a quick answer - marking my 2nd EME QSO ever. This time I actually had my settings in WSJTX correct, and used the 'short' versions of the messages, which forgoes a message report and just exchanges callsigns and a 'over over over' message. Either way, it was awesome. Life has been really busy lately, but I'm still finding time here and there to do some fun Ham stuff. This was project was cheap, used mostly stuff I already on hand, and was loads of fun. 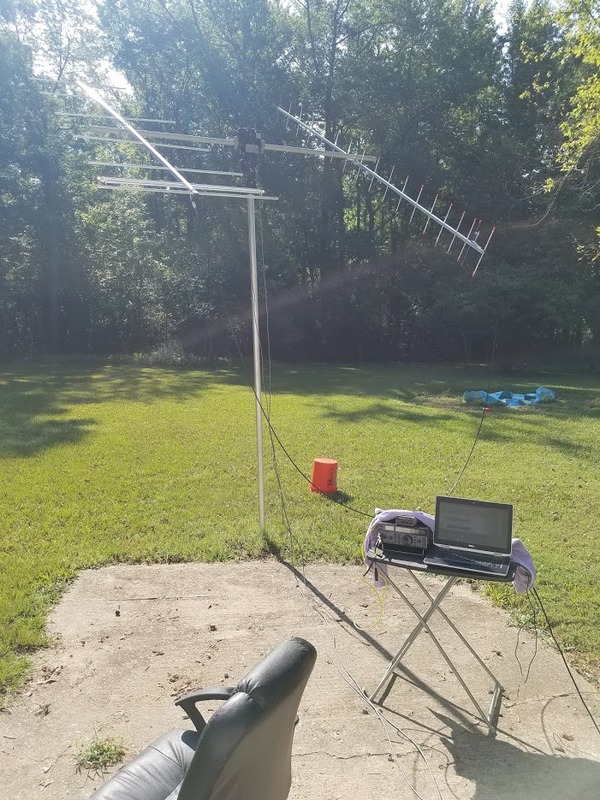 I have no plans to develop a huge EME station, but it was super cool to tinker a bit and make a couple of contacts using the 'ultimate dx' method. 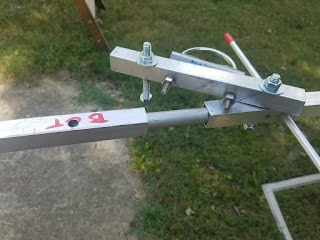 If you've even got a modest UHF setup, I'd highly recommend you give Bernd, Frank, or any of the big gun EME stations an email and setup a sked. You might surprise yourself with the results, I sure did. 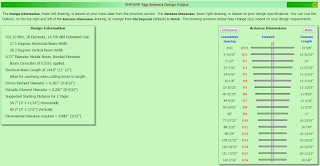 Very nice project and what a cool QSO. Thanks for this blog post and insight into EME. I just realized that your 432 Lunar Arrow antenna would be a perfect entry to the Central States VHF Conference's antenna measurement range. Next conference is in July 2019 in Lincoln, NE. FYI. Wyatt was there this year. Also, lots of fun to check out the rover row. My name is Dave, and I'm a Ham radio operator here in Central Arkansas. I got licensed back in May of 2014, but I've discovered some really fun things you can do with radios since then. 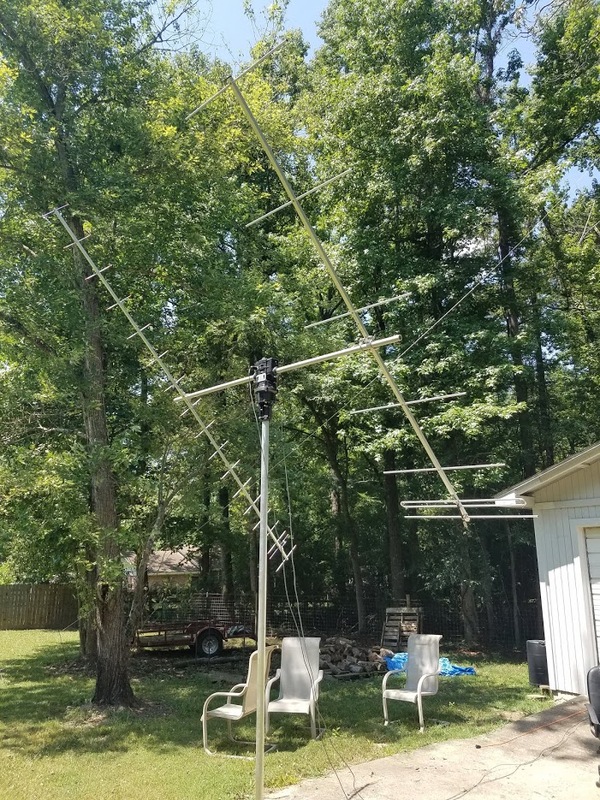 My specialty is working Amateur Radio Satellites, but you'll find me doing mountain-top VHF/UHF work, and operating backpack portable as I climb many of the great peaks here in the Ouachita and Ozark mountains. I practically never operate from my house, as I've got better things to do when I'm there, but while I'm out and about, a radio is never far away.